good a reason to start a blog as any. I w as tagged by Maureen Brownlee, who was recently featured on the cover of BC Bookworld. 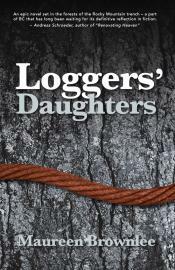 The review describes her book Loggers’ Daughters as: “a story that could have been set in the Ozarks, but it is a realistic and deeply felt novel of central BC.” They even compare it to a Margaret Laurence novel. I’m reading it now, and can barely put it down as the hard-done-by protagonist Adare stands poised to lose her farm and home. All around her are harsh and fragile realities. Maureen’s visceral descriptions infuse the novel with mountains, the woods, and the essence of farm life. I met Maureen at the Sage Hill Writers’ Experience in Saskatchewan a few years back. Here’s her blog tour post. My pet name for it is The Never-ending Novel. But really, it’s almost done. This time I mean it. Leah is a 25-year-old Junior Customer Service Paradigm Facilitator at a company called Decorate America!, trapped in a work world she doesn’t understand. Her mother is addicted to the Shoperama Channel. She gets promoted by one of her three bosses — to a job she already has. Her friend, the omnipotent director of IT, offers her a way out. Using the latest virtual, simulation and holographic technology, his department will cover for her while she plays hooky from work for six months. What better place to find herself than in the tropical paradise of Thailand? Unfortunately, paradise is anything but. People are always saying, ‘You look good for your age.’ We’re always saying sorry for how we are. We’re not what we once were. What I say is get over it. Stop congratulating ourselves on looking good for our age, and instead congratulate ourselves on being good. But hey, I’ve got a long way to go. Forty is the new twenty. Who says you ever have to grow up? I can’t wait. I’m going to have a lot of fun with this one trying to kick societal myths about beauty and aging to the curb. I have few other projects smoldering on the back burner, including a new adult fantasy novel with a working title of Soulless, a romance-thriller set in Portugal called Sagres and a commercial women’s fiction book about friendship set in the Deep South called Barbecue With Dignity, For Ladies. Writing helps me make sense of a world that doesn’t make sense. Sometimes I have an emotional question that needs an answer. For The Great Cubicle Escape, I was aiming for the zeitgeist of how people are feeling nowadays. Tapping the zeitgeist is an elusive thing, because how I feel isn’t necessarily how everyone else feels. Hitting it is like finding water in the desert or trying to make a YouTube video go viral. But why not aim high and fail greatly? I was thinking about office culture and work and how nothing in school really prepares us for the reality of life behind a desk. There’s a truth that if you love your job, you’ll never work a day in your life. Not only are we supposed to do work, but we are supposed to love it. The quest for meaningful work is one of life’s greatest challenges. Some people choose meaningful life, and work becomes a means to an end. As for process, when I was writing this novel, I wrote 1,000 words a day until I got to an ending. That didn’t take very long. Fixing it took a lot longer. For my next novel, I’m starting with an outline. Because I’ve always written for work as a professional writer (my business is called Essence Copywriting), I bring a discipline to my work. There’s nothing I love more than a good writing project. Especially one that’s done! NEXT UP: Vancouver, B.C. writer Jay Allan Storey is my taggee. He has been with me through a few incarnations of Vancouver writing groups. Jay created a terrifying post peak-oil world with his first novel Eldorado. Picture vine-strewn Walmarts and a world where oil is the new gold. Jay also writes insightful articles about writing on his blog. Read my Eldorado review on Amazon. This entry was tagged blog tour, Maureen Brownlee. Bookmark the permalink.